We are in for a WHOPPER of a snowstorm this weekend - latest prediction says 14 - 20 inches, but possibly up to 28 inches. Whew, oh boy, I'm going to be sore after all that shoveling!! Meanwhile, my mind is already starting to plan my spring garden. What the heck is wrong with me? We have months and months of winter ahead of us!! Ahhh, but the truth is I'm not completely crazy....it's nearly time to start the seeds, so I need to order the supplies I need! Last winter I put together a timeline for myself, so I would know exactly what needed to be started when. This year I'm going to go with the earlier dates for many of the seeds, so they are that much stronger when they finally get planted out. That means I need to be ready to start the first seeds by the end of February....can you believe it? That's just a little over a month away! I used up all my seed starting soil as well as my Cow Pots last season, so it was time to replenish my supplies. 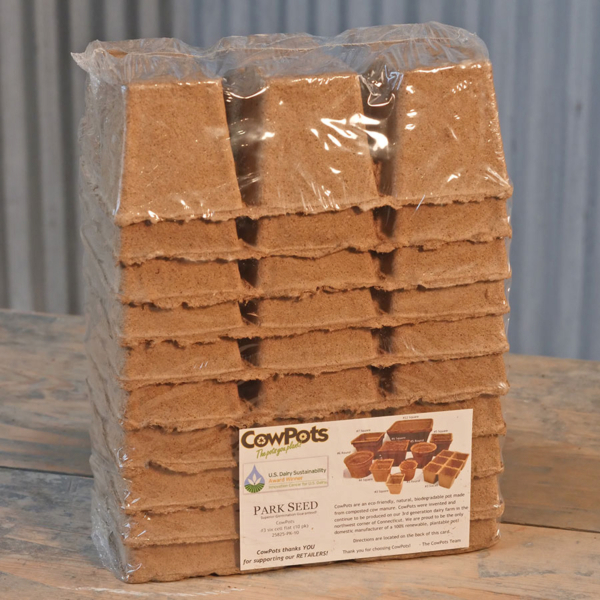 I found the best price on Cow Pots at Park Seed, plus I had a 10% off coupon, so I ordered 10 of these set of 10 six-packs - that gives me 600 little pots, which is more than what I need for one season for sure. 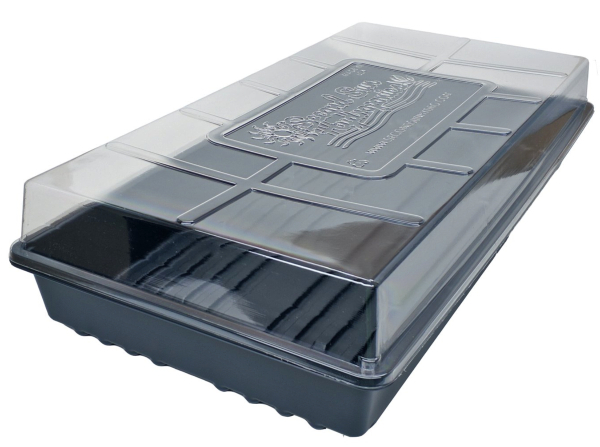 I have ten of these humidity dome plant trays, and they each fit 3 1/2 six-packs, for a total of 21 pots per tray. That's 210 pots per season, so my order of 600 pots will last me nearly 3 seasons. Actually, last season I also used cardboard egg cartons to start some seeds also, so I must have started about 300 plants. That saves a TON of money at the nursery each spring! 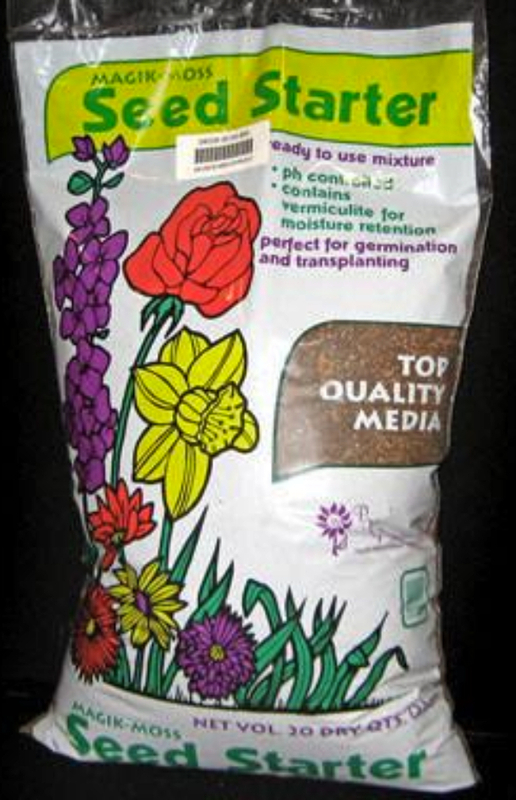 I also ordered this seed starting mix from Harris Seeds, 20 qt bags, and I ordered 5 bags. Their price was a lot better than the other sites, and I had a free shipping coupon, so I was happy with this purchase. I'm not sure if I'll use all 100 qts, only time will tell. I can't remember how much seed starting soil I went through last season....for all I know I might even have to buy more. Next step is to do a seed inventory and see what I may need to order this year. It's not usually much, each seed packet lasts me a few years, and I generally pick up a few random packets at the end of the season when they go on sale. 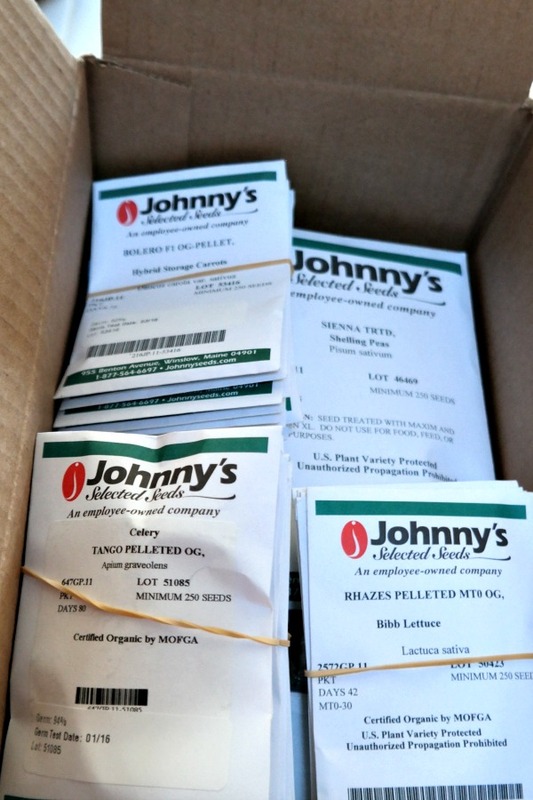 I love Johnny's Selected Seeds, I've been using them for a number of years and they never let me down. Year after year they are viable, despite what most seed companies would like you to believe. Starting my own plants from seed takes a little extra work, for sure, but it's so rewarding on so many levels! First of all, I save huge money each spring by starting my own seeds rather than buying seedlings from the local nursery. Plus, I save money on food by growing some of my own. And there's nothing more rewarding than pulling out a sauce or soup from the freezer in the middle of winter, knowing I grew those veggies from seed, starting them in the utility room the winter before! 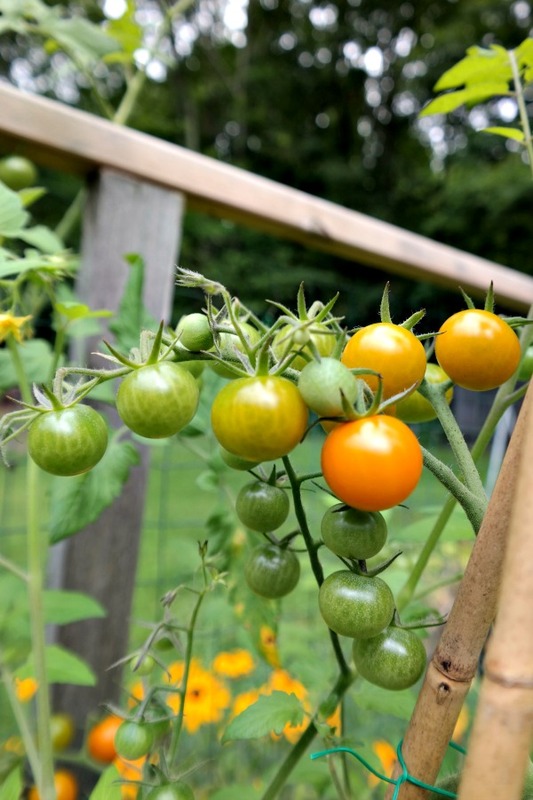 Come July, I'll delight in standing in my veggie garden eating tomatoes right off the vine, warm from the sun and bursting with flavor. I'll delight in the fact that I started them from seed while the garden slept under a blanket of snow. There's not much in a gardener's life more gratifying than that. I don't have the space to start from seeds, though I envy you! We had 19 inches of snow in Dec, so I feel for you with the shoveling! We didn't get 28 inches, only about a foot, Penny - whew!! It was that terrible heavy snow, though, and I feel every bit of the shoveling in my sore body today! It is early, Jenn, but certain plants need that head start, especially with our short growing season up here. The storm that hit here yesterday afternoon and is just now tapering off is headed your way. I'm sorry! You guys are in for a lot more than we got, that's for sure. I think we only have about 6" but there's a lot of blowing and drifting right now, so hard to tell. And then are temps are going to plummet where the wind chills will be below zero. Yuck! You always get so much done, it amazes me since you work FT. I have nowhere to start seeds indoors though I suppose if I really wanted to, I could do the whole set up in my basement with grow lights and such...but I don't have a desire to do that, lol. I don't have a big garden like you do though, I only plant tomatoes and maybe one or two other veggies. I force myself to get things done, Melanie - after all, there's only me to do it! Last year I got a late start on my seeds, and with our short growing season I can't do that again...it affects how much we produce. You are a very dedicated gardener! I sure hope your weather prediction is wrong. Ours was...we were expecting snow and instead we have rain. Enjoy your weekend...stay warm! We got it all, Donna! Snow for 18 hours, and then rain, which changed to sleet, and then back to snow! Shoveling was a nightmare, it was soooo heavy! This is awesome Debbie that you are starting to think about planting your veggies for Spring. We are getting the same snow storm here in Illinois. Already 5 inches on the ground and more is coming down fast. Ugh I am not a veggie gardener but I cannot wait for flower time. We will end up with about 10 to 12 inches. Stay warm and cozy in your sweet home. I wish I had a fireplace like yours on days like this. I miss having a fire going during a snow storm outside. I'm sure you do miss a fireplace, Kris, I can't imagine a house without one after having one in my last 4 homes! Of course when I was in the city I didn't have one, but in the country I feel as if it's a necessity! I can't allow myself to look at the seed catalogues until I make a list of what I actually need, Vickie, otherwise I'll end up with way too many seeds!! You are so right! I would be doing this too if I had an area to do it in with any light. Wow that's alot of snow. We are getting hit starting tonight and into tomorrow. We are in for a big shot of ice since temperatures will plummet Sunday night. We worry most about power outages. You have your cutout for you. You have a green thumb for sure. We don't have room to have a large garden. Can't wait to see your garden grow. I'm amazed we didn't lose power, Cindy, and I hope you didn't either! My sweetie bought me a generator as a housewarming gift when I bought my home, and it's such a great feeling of security to know it's going to kick in if the power quits! love that picture of the gorgeous tomatoes!! YIKES!! I cannot even imagine that much SNOW though!! Stay in, stay warm stay SAFE!! Hope you can get pictures for us. 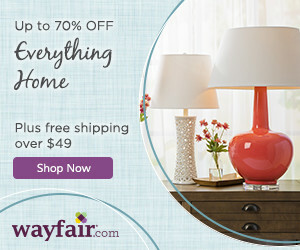 Does your power go off with snowfall that heavy? We often lose power, Debbi, but we didn't this time....surprising! I need to get some supplies laid in for seed starting soon. I get so interested in all the seed catalogs, then often end up starting too soon. I still am missing something in the process, as I get nice seedlings that seem to start strong then stop growing at all before it is warm enough to transplant. Must do some research this year. I wonder if they are getting root bound, Carole? Or do you need to use a diluted organic fertilizer? I generally start with a water soluble fertilizer at half strength once the second set of 'true' leaves appears. January is definitely seed catalog month, and I am already planning what I will grow. Cauliflower is on the àgenda for this year because it is so darned expensive. I don’t have a good space to grow from seed. I certainly envy yours. I never had much luck with cauliflower, Pattie, and since Sweetie hates it I don't bother with it. I do pick it up at the farmers' market, however, and sneak it into soups and stuff.....he doesn't even know it's there, ha ha! Oh wow, that is a lot of snow! We got a foot here and staying in reading seed catalogs sounds really good right now! I got a new-to-me used gardening book in the mail last week, Linda, and I'm dying for a chance to sit down and devour it from cover to cover!